Why should I play at the Slots of Vegas Casino? We have an exclusive Slots of Vegas bonus code awarding all new members a $25 free chip no deposit bonus! 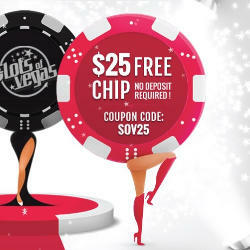 Redeem the Slots of Vegas coupon code SOV25 and get your $25 free chip today! Click here to receive a $25 FREE CHIP! Find all our recommended Slots of Vegas bonus codes below. SOV25 $25 Free Chip - No Deposit Bonus 30x Wagering Requirement (Slots and Keno Only), and $25 Minimum/Maximum Allowed Cash-Out. NEW300 300% No Rules Deposit Bonus No Wagering Requirements (Slots and Keno Only), No Max Cash-Out. $30 min deposit. VAULT $25 Free Chip - No Deposit Bonus 30x Slots, 60x Table Games, $100 Minimum/Maximum Allowed Cash-Out. NEW190 190% Table Games Deposit Bonus 30x Black Jack and Video Poker, No Max Cash-Out. $30 min deposit. Slots of Vegas is a US-friendly online casino that offers several welcome bonuses to choose from, starting with a $25 no deposit bonus offer, a 300% deposit bonus, and then another $25 free chip offer – we’ll show you how to take advantage of all three promotions! In addition to the new player bonuses, players may also participate in the daily special, the monthly promotion, or any of the other distinct bonuses available. And when you make a deposit, redeem the coupon code NEW300 for a 300% initial deposit bonus! This bonus has no wagering requirements and there is no maximum withdrawal limit! Slots of Vegas offers a mobile friendly casino and live dealer casino games as well! If you are new to the Slots of Vegas Casino, then you should definitely start with the free $25 no deposit bonus. There is no deposit required and there is no risk. Just register your new account, then visit the Cashier, click on Redeem Coupon, and enter the coupon code SOV25. Redeem the Coupon Code SOV25 and receive a $25 free chip! 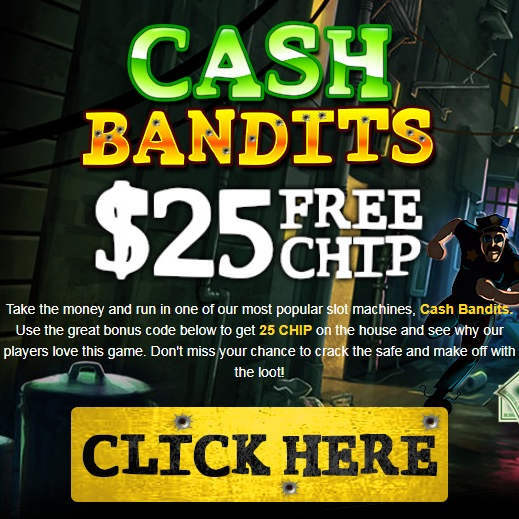 The $25 free chip is only valid for slots games or keno, may only be used once, has a play through requirement of 30x, and is limited to a $25 cash out. Yes, you CAN make a withdrawal from this $25 free chip without making a deposit, if this is the first no deposit bonus offer you’ve redeemed!!! Click here for your free $25 no deposit bonus! After you’ve redeemed the SOV25 bonus code, you will have to make a real money deposit. Slots of Vegas does not allow you to participate in two no deposit bonuses back to back. So now visit the cashier and make your deposit, but then prior to playing any games, redeem one of the two bonus codes described below, depending if you want play most slots or mostly table games. Redeem Coupon Code NEW300 immediately after making your deposit, and receive a 300% deposit bonus. Minimum deposit is $30, and there are no play thru or wagering requirements! There is also no limit on your withdrawals. You may ONLY play Slots or Keno, all other games are prohibited! Click here to redeem the NEW300 bonus code! Redeem Coupon Code NEW190 immediately after making your deposit, and receive a 190% deposit bonus for up to $1,900. Minimum deposit is $30, and there is a 30x wagering requirement when playing Video Poker or Blackjack. The following table games are STILL RESTRICTED: Craps, Roulette, Baccarat, Pontoon 21, War, Sic Bo and Pai Gow Poker. There is no wagering requirement when playing Slots, Keno, Bonus Bingo, or Scratch Card games. There is no limit on your withdrawals. Click here to redeem the NEW190 bonus code! After redeeming one of the deposit bonuses, and satisfying the wagering requirements (and making a withdrawal, you can now take advantage of another no deposit bonus. Get ANOTHER $25 free chip no deposit bonus with the Slots of Vegas promo code VAULT. Redeem Coupon Code VAULT and receive a free $25 chip for the mobile casino! There is a 30x wagering requirement when playing slots and a 60x requirement on table games and video poker. There is $100 maximum and minimum withdrawal limit from playing with this bonus. Click here to receive another $25 free chip! Alternatively, you can click on one of the Play Now or Download buttons to immediately download and install the Slots of Vegas Casino desktop software. After you’ve downloaded and installed the software, then you can launch the application and register your account from within the software. Claiming the bonus requires visiting the Cashier and clicking on the Redeem Coupon tab. The code for the 300-percent bonus that applies to slots and keno games is NEW300. The code for the 190-percent bonus that applies to blackjack, video poker and other table games is NEW190. Each bonus requires a minimum deposit of $30. NEW300 matches the deposit by 300 percent with an unlimited bonus amount. NEW190 matches the deposit by 190 percent and is worth as much as $1,900. Slots of Vegas will deposit all bonus money into your account as soon as the deposit used to claim it has cleared. You can begin using that bonus money immediately. All stakes on a game that are eligible for your bonus contribute to the wagering requirements fully. In other words, if you selected the blackjack bonus, each $1 bet on blackjack contributes a full $1, which is unusual. Nevertheless, Slots of Vegas has strict rules about playing non-eligible games, and that is discussed in further detail in the next section. The NEW300 bonus code does not have any play thru requirements, however they are strict on which games you are allowed to play. The NEW190 bonus code allows for play on blackjack and video poker, but applies a 30 times wagering requirement on the sum of the deposit and bonus amounts. In other words, if you deposited $1,000 to receive the maximum bonus amount of $1,900, you would have a total of $2,900 to play with. You would need to wager a total of $87,000 before processing a withdrawal. This is actually an excellent blackjack and video poker bonus if those are your games of choice. It is crucial to pay attention to applicable and excluded games at Slots of Vegas because the casino does not maintain separate accounts. If you have claimed the slots bonus, for instance, then the casino will void any winnings from blackjack or video poker machines. In addition, there are certain games that never contribute to wagering requirements regardless of their void status, and these games include baccarat, craps and roulette. Note that all wagering requirements must be met prior to cashing out, and any premature cash-outs result in voiding the entire promotion. Additionally, Slots of Vegas bonuses are not cashable, which means that prior to the first withdrawal since claiming the bonus, the casino will remove the full bonus amount. There is, however, no maximum limit on withdrawals of winnings derived from bonus money. Slots of Vegas offers a new deposit bonus each day and a special deposit bonus each month, and high rollers can take full advantage of all of them. Check out the Slots of Vegas Casino today! Get multiple $25 no deposit bonuses! Slots of Vegas is run by the Gwages group, which also manages the popular Cool Cat Casino and Palace of Chance Casino. Click here to read our recommendations for Cool Cat bonus codes and Palace of Chance bonus codes.